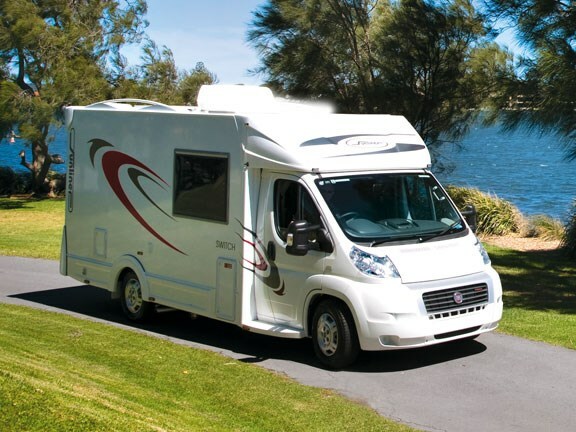 Sunliner’s Switch has obviously been designed to produce a budget-trimming motorhome – however that doesn’t mean that any of the Sunliner essentials have been left out. 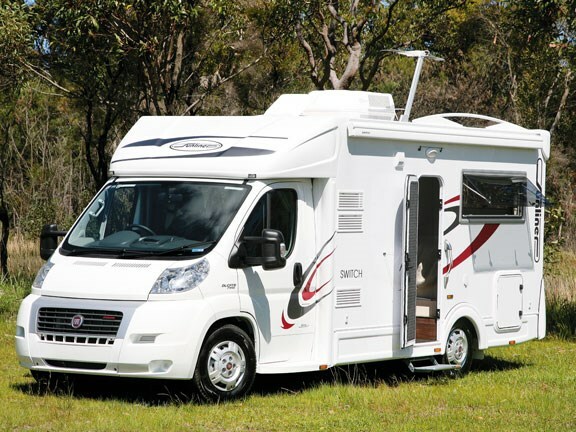 For the motive power, a tried and trusty workhorse – the Fiat Ducato – is used as a base vehicle. The Multijet 160 model is powered by a 115.5kW turbo-diesel motor, and drives through a six-speed AMT (automated manual) gearbox, something that certainly gives the Switch plenty of grunt, given that it has a wet tare weight of just 3340kg. Instead of the Ducato chassis, the Switch comes with an Al-Ko chassis that has a maximum load of 4490kg, thus providing a generous load capacity. Like all Sunliner motorhomes, the Switch doesn’t have a frame. Instead, the body is built using fiberglass composite walls based on a steel chassis. Sunliner’s trademark top and bottom fiberglass mouldings at the rear remove the boxy motorhome look that is often a characteristic. Indeed, the B-class non-Luton Peak style of body gives the Switch a very streamlined look. Seitz hopper windows are used all round, along with a Camec triple-locker security door. External bin storage is fairly limited: in addition to the offside bin (for two 4.5kg gas cylinders), there is just one bin at the rear nearside that, unusually, is sealed off from the rest of the under-bed area where it is located. At seven metres long, the Switch is a length that gives designers plenty of latitude with the interior layout, while still providing a motorhome that isn’t difficult to drive – especially as it comes with large external mirrors and a reversing camera. 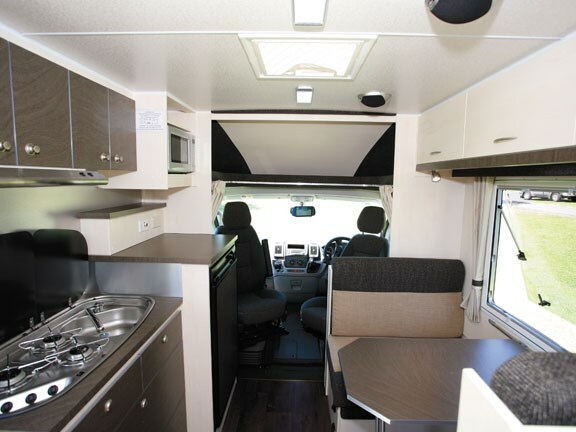 Inside the Switch, the layout has a mid-section entry door, with bed and bathroom to the rear, and the nearside kitchen and offside dinette to the front. Included are the Ducato fitted swiveling seats, and although they don’t quite fit into the general design, they are still useful to have nonetheless. 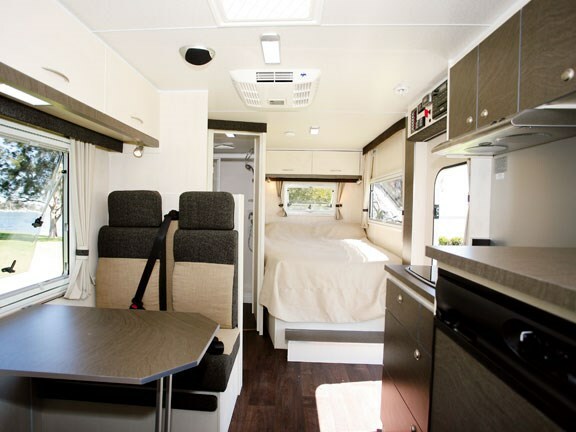 Although the Switch very much has the Sunliner décor, in keeping with the more budget emphasis of the motorhome, it is done in a simpler style, while still maintaining some of the Sunliner essentials, such as LED lighting, a comprehensive control panel over the entry door and a bit of class about the general interior look. Generous window space all-round, plus a large, central roof hatch and a roof-mounted, Aircommand Cormorant air conditioner, both allow plenty of light and ventilation. 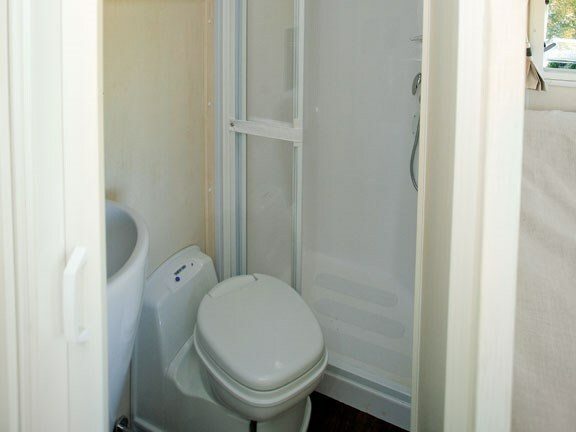 In order to include a bathroom that has a separate shower cubicle and cassette toilet, the Sunliner design team has fitted both the bathroom and the bed into the rear area, meaning the 1880mm x 1346mm double bed occupies the nearside corner area and the bathroom takes up the offside space. The bed has windows in both the side and rear walls, and is designed so that neither occupant has to climb over the other to get in or out. Under the mattress, the bed base can be lifted to get to the storage area underneath. It is not all empty space: in addition to the 100ah house battery and Truma 14-litre hot water heater, part of the under-bed area is taken up by the external bin. The bathroom layout design includes a separate vanity wash basin and both a shaving cabinet and shelves for storage. Outside, between the bathroom and the dinette, is a wardrobe area with both hanging space and shelves. In a design like this, it’s not surprising that the kitchen bench area has been a bit squeezed. Most of the bench top space is taken up by a stainless steel, Dometic three-burner cooktop and sink combo unit, but that means no sink drainer and no grill. Adjoining the cooktop/sink unit is a Thetford 128-litre three-way fridge, the top of which can be used for locating the flat-screen TV, given the proximity of both a power point and antenna connection. General kitchen storage consists of several different sized drawers below the bench level, with overhead lockers above. Also set in the overhead locker area above the fridge is a Sanyo microwave oven.